This Sept. 6, 2016, file photo shows Gabon troops standing guard outside the senate government building in Libreville, Gabon. Gabon's government has retained control of the West African country after an attempted military coup early Monday in which two plotters were killed, the government said. Five army officers who took over state radio in the coup attempt have been arrested, government spokesman Guy-Betrand Mapangou, told Radio France International. 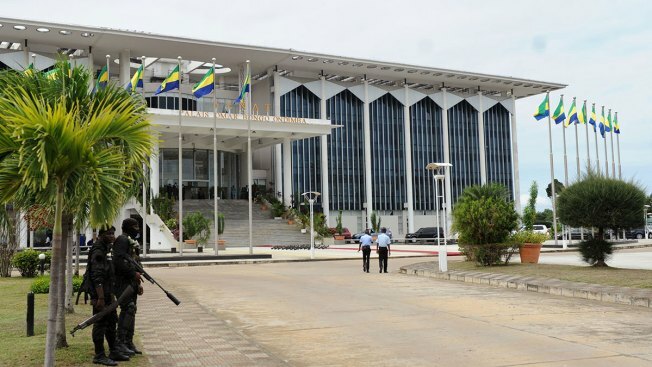 Authorities regained control of state broadcasting offices and a major thoroughfare in the capital, Libreville, which were the only areas taken over by the officers, the spokesman said. Those soldiers have been taken into custody and President Ali Bongo's government remains in control, the government spokesman said. Gabon, which is sub-Saharan Africa's third-largest oil producer, has been ruled for more than half a century by Bongo and his father, Omar, who died in 2009. Critics have accused the family of profiting from the country's natural resources while not investing enough in basic services for the population of more than 2 million. About one-third of the population lives below the poverty line, according to the World Bank. CORRECTION (Jan 7, 2019, 7:30 a.m. ET): An earlier version of this story misstated from where Bongo gave his New Year's address.